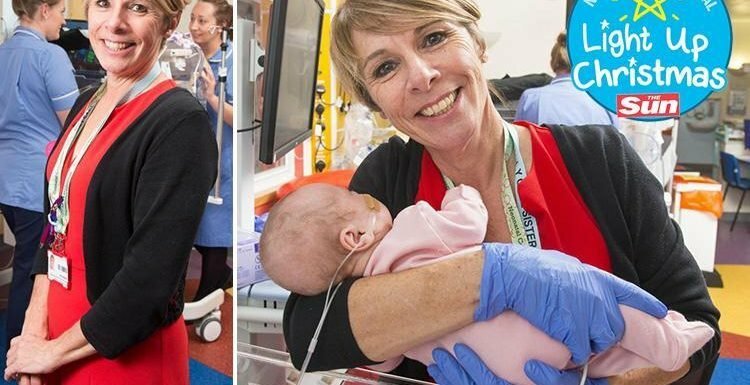 The Sun’s appeal is raising money for Bliss, the leading charity for premature and sick newborns. Lisa continued: “I remember a ­little boy who was born at 23 weeks. “He very nearly didn’t make it but he has just gone to school. He’s the epitome of what we do here. To see him now, happy and thriving, is why we do this job. Lisa started her career in adult nursing before moving to the neo- natal unit when she was 24. She said: “There are lots of ­families that I remember, the babies you look after always stay with you. “One baby I cared for back in 1990 now works as a healthcare assistant on the unit. “Please give as much or as little as you can. DONATE BY TEXT:Sending BLISS followed by the amount (e.g. BLISS £10) to 70085. You can choose to donate £1, £3, £5, £10, £15 or £20. You will be charged the standard network rate when texting your keyword. OR BUY A BEAR: YOU can make a difference to the life of a baby this Christmas by buying an adorable My First Bliss Bear. The cute white bear called Scuby, named after Special Care Baby Units (SCBU), holds a smaller brown bear called Inky, named after incubators. These gifts cost £8.50 each and the money goes directly to Bliss. You can buy a bear here.